See Brett’s new play COMMUNITY SERVICE— a comedy in which a popular high school girl must do “community service” by going on a date with a geeky peer– as part of TinyRhino: Love Potion Edition. 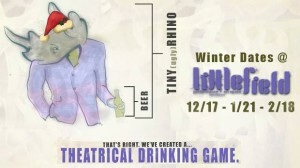 TinyRhino is a theatrical drinking game. Drink every time one of five elements is introduced in one of six short plays you’ll see. My play stars the very funny Layla Khoshnoudi, Alex Herrald and Glenna Grant. Dir: Eddie Prunoske. TUESDAY FEB 18 at 8p. (Doors 7:30p).